Looking good! 7-0 top of three.... hang on..... move on! Turn on the game and first thing I see is the home plate ump calling an obvious fair ball a foul stealing a run from Oregon. Wow this team is on fire! I probably should know this by now with how often it happens with our Oregon Ducks, but what exactly is the run rule? DUCKS WIN DUCKS WIN DUCKS WIN!!!!!! 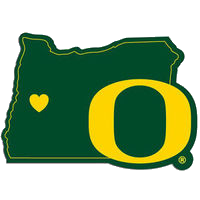 I'm pretty sure the Ducks will play 8-seed Arizona State in the first round of the world series on Thursday. How the bracket shakes out beyond that depends on whether they beat ASU, but if they do they'll play the winner of Washington-Oklahoma. It's be a double-elimination eight-team tournament, and the way the math works out you have to win three times to make it the Finals (which is then a best-of-three series against the other finalist). Well, Kentucky, that was the number 1 team. Great sendoff for the seniors, no mistakes by Lindvall , a grand slam for DJ, a triple for Svekis, Lilley gets a sharp hit up the middle to bring in the last run of the game in her last at bat at The Jane, it was great hearing the crowd chanting, "JENNA LILLY". Nice way for Shannon Rhodes to snap her batting slump, and what is there to say about Miranda Elish! I wonder who will pitch that first game? Should be Elish. She has established herself as our ace. She’s pitching to the spot on the hitters and seldom leaves a pitch on the middle of the plate. Kleist just seems to have been overcome by the pressure in the last game. I expect her to start game two and redeem herself. If not you then have Elish and Balint ready to go. That’s how I would do it but coach hasn’t called me yet to ask my opinion. I think it will be Kleist in Game 1 against ASU, and Elish will be ready for Game 2 against either Oklahoma or Washington. I'm guessing Elish vs ASU on thursday, then Megan next game. She did shut them down in regular season, wonder if Mike would want Elish to see them so Oklahoma doesn't have any previous experience. I would still expect Elish game 1 to get the win and stay in the winners bracket.